Even silence reverberated off the walls of the auditorium as Frisner Augustin took his award. The New York Academy of Medicine, a 1926 Art Deco interpretation of the Romanesque on the Upper East Side’s Museum Mile, could hold more than five hundred people in its auditorium, and City Lore’s event had the house fairly full. You would expect, in the middle of an awards ceremony honoring grassroots contributions to New York’s cultural life, the usual coughs, murmurs, and rustle of programs. Instead, you could hear the proverbial pin drop. I stood in the back of the hall holding my breath as he cradled the award—a broad and shiny bronze replica of New York City’s historic subway token. As he studied the token, Frisner, a street-wise veteran of a Port-au-Prince ghetto, wept. City Lore, an organization founded in 1986 by folklorist Steve Zeitlin to foster New York City’s living cultural heritage through education and public programs, established its People’s Hall of Fame in 1993. To date, sixty-four individuals or organizations representing diverse communities have received the award: an 18.4 cm-wide classic New York subway token sculpted in bronze and mounted on a Plexiglas base bearing the honoree’s name and mark of distinction. 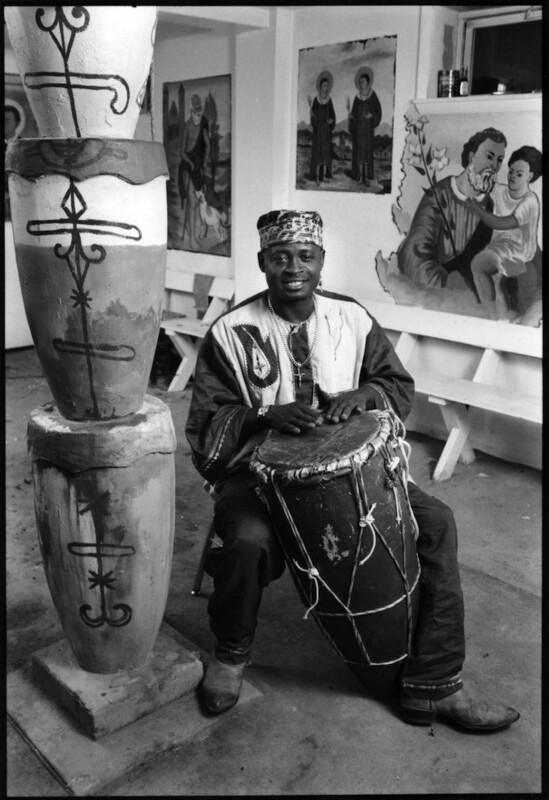 (Frisner’s reads, “Frisner Augustin, for artistry as a Haitian Vodou drummer.”) City Lore calls these trophies “Tokens of Esteem.” More importantly, however, the recipients receive a night of honor, with distinguished guests invited to present the awards. Artists from the honorees’ communities add to the acclaim with performances. A reception following the ceremony gives audience a chance to mingle with the honorees. Frisner’s friend and drumming student Annie Sessler arrived early the evening of November 19, 1998, to videotape the entire event. Frisner arrived early as well—in a brand-new suit for the occasion. The 110-minute recording captures Frisner conversing with students, friends, and City Lore staff and Board members well before the event started. On watching, it becomes evident that he was thinking about his modest beginnings as the child of a struggling family in Haiti. He was clearly overwhelmed by the recognition he was about to receive, and how it marked the distance from where he had begun. He expressed himself to audience after a glowing tribute by late filmmaker and longtime fan Jonathan Demme. Annie’s tape captured the socializing before the ceremony, the entire ceremony, and the reception that followed across the street in the Museum of the City of New York. We offer below an excerpt from Frisner’s segment of the ceremony: host Isaiah Sheffer’s introduction of Jonathan Demme, Demme’s homage and presentation, and Frisner’s moving acceptance. The full recording includes a performance by the Haitian American children’s troupe Tonèl Lakay, directed by community activist Marie Edith Jean and accompanied on drum by Frisner. You will be able to catch the entire event once the Frisner Augustin Memorial Archive goes online. We have more video to digitize before launching the website. Please help us in this effort by making a tax-deductible contribution here. Many thanks for your support. 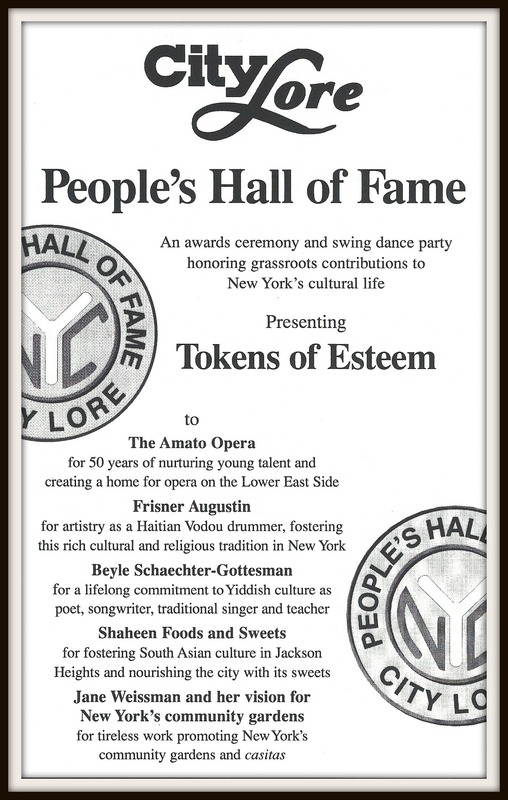 Featured Image: City Lore’s People’s Hall of Fame Token of Esteem, visible head-on here. Photo by City Lore photographer Martha Cooper, taken in the basement temple of Edeline Sanon in Canarsie, Brooklyn, for People’s Hall of Fame 1998 publicity. Used by permission. 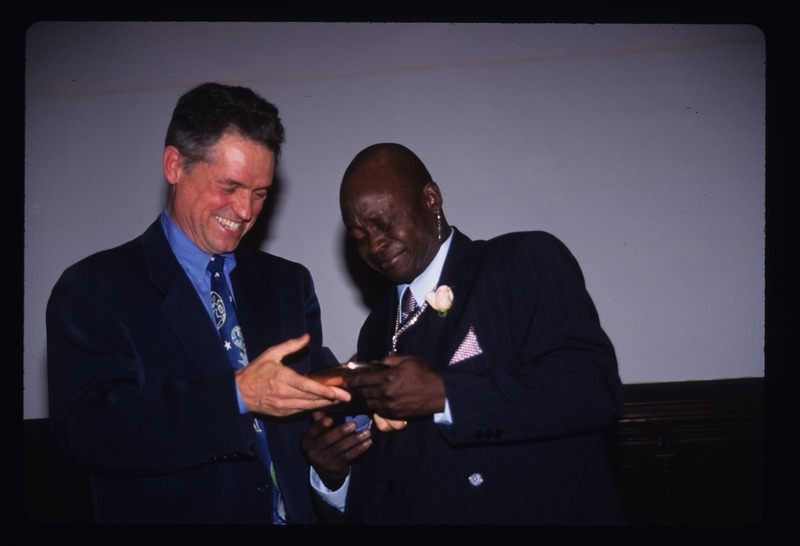 Photo by City Lore photographer Martha Cooper, showing Jonathan Demme (left) presenting the People’s Hall of Fame award to Frisner Augustin, November 19, 1998. Used by permission. This entry was posted in Tales from the Archive and tagged Archive, City Lore, Drumming, Drums, Frisner Augustin, Haiti, Haitian, Haitian Music, Music, Vodou. Bookmark the permalink.